Boom Tunes is a compact, lightweight device that turns anything into a speaker that lets you play music around the house, outside, or anywhere you go! 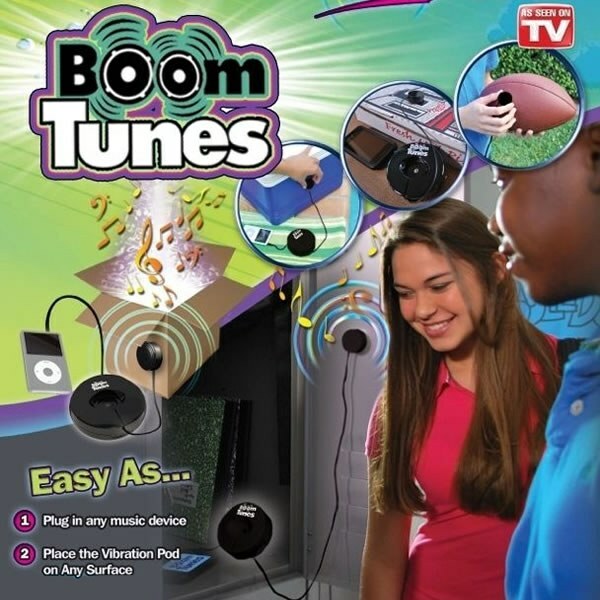 Simply plug it into any ipod, music player, or computer and stick the Boom Tunes on a box, table, water bottle or any surface that reflects sound! The bigger the object, the louder the sound. With Boom Tunes, you can turn anything into a speaker- from boxes to cups, to cans, coolers and tables, and even sneakers....almost anything you can think of! The secret is the vibration pod that transfers crystal clear sound with treble and bass to any object. Stick it on almost anything and BOOM...its a speaker. You also get a black carrying case with a built in clip to keep your Boom Tunes handy and a DC-USB power cable and an audio extension cable.